A young girl named Lyn is the long-lost heir to the throne of Caelin, but her great-uncle is seeking to have her killed so he can ascend to the throne himself. Accompanied by a host of knights, Lyn fights her way to her home kingdom and take her rightful place as heir. 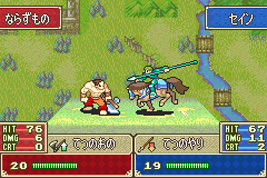 In the second part of the game, Eliwood, Hector and their army are hunting a faction named Black Fang, who are seeking to open the dragon portal, enveloping the world in an ancient conflict. Each chapter has a mission that you must complete. Move your troops around the map and intercept enemies. If you lose a unit in battle then they are lost forever, while losing Lyn or Eliwood restarts that chapter. In Chapter 16x/17, you can visit Anna's Pub. Anna and Jake were originally characters in Fire Emblem: Dark Dragon & Sword of Light on the NES, but have made a guest appearance in every Fire Emblem title since.